Planning on hosting a Halloween party with spirits? And yes, I'm referring to the kind you drink. Use this party calculator to see just what you'll need. Remember, you can usually return unopened bottles so don't worry about buying too much. It's all in the details. 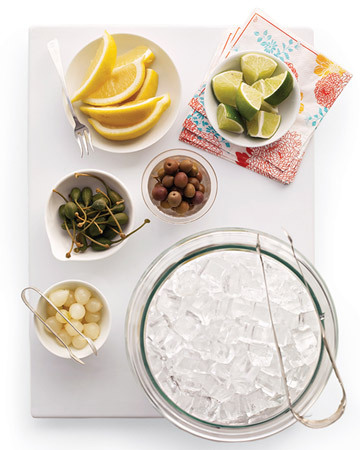 Don't forget to set up a drink garnish station and set out the appropriate glasses and stemware for your guests' beverages of choice. Jon and I are heading to a Halloween party tonight, and I have to say our costumes are pretty funny. I'll be sure to post the surprise later.